We start with a look at the first film in what eventually grew to become the "Marvel Cinematic Universe", the fantastic Iron Man. We continue with a look at the least-loved film of the MCU and Marvel's second attempt at adapting the Hulk to the big screen. Iron Man is back in a somewhat flawed second installment to his series, and we'll take a dive into this film to see why all the villains on display couldn't make this film work. We look at the next hero for the MCU, Marvel's Asgardian god-hero, Thor. Does his adventure stock up to Iron Man's first outing, or is he more of a Hulk? Marvel goes back to World War II and we take a look back at the first film in the Captain America series. 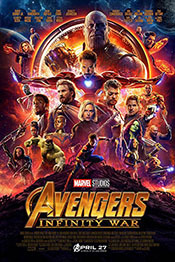 Bringing it all together, Marvel unites their heroes in a single movie, a capstone to their individual films that became a crossover smash hit. Starting into the second "Phase" of the MCU, we take a look at the third (and final) film in the Iron Man series. The character lives on, but this film gives us a conclusion to his personal arc. We go back to Asgard for a look at the second Thor film, now with 100% less Kenneth Brannaugh and 100% more Dark Elves. Teaming up Cap and Black Window, Marvel created a tense spy thriller for this second installment in Cap's series. We take a look at the film to see just how deep the conspiracy goes. How do you film what should be an unfilmable team series? Marvel did it, through the power of James Gunn, and we take a look at the film many favorably compare to Star Wars. After the huge success of the first Avengers film, Marvel had high expectations for the sequel. We take a look at the film and try to figure out if it's a hit or a miss. After the big bombast of Age of Ultron, Marvel pulled back for a smaller, funnier story about a hero that's both small and funny. It's Cap v Iron Man is the superhero battle of the century. We take a look at the film to see how it all shakes out when friend fights friend. Will the Avengers be able to stand against internal strife? Marvel takes a leap into the world of magic with the introduction of their "Sorcerer Supreme". We take a look to see if it's as... well, as magical as hoped. What more could you want for a second Guardians film? How about more of everything that made the first film great. We take a look to see how it all worked out. With a new reboot of Spider-man out, we review the third iteration of the web-head in 16 years. Is he more hero than insect? Let's find out. After two decent, but not great movies, Marvel took the third Thor in a different direction, to great effect. We take a look at how the film shakes out, if it's really the smashing success people say. Ever since Blade left the silver screen, there's been a notable lack of Black superheroes. With their 18th film in the MCU, Marvel took a stab at fixing that. We look at the film to see if it's as good as hoped. Marvel's back at it again, smashing their superheroes up against a powerful villain looking to eradicate life across the universe. Can the Avengers stop this new threat, and will the film be any good? We review it and see. Once again, after the hero-smashing of the third Avengers, Marvel goes back to ol' Ant-Man for a small film to lighten the cinematic universe just a bit. We review it and see if his small size leads to huge success. A new hero joins the fray when Captain Marvel comes crashing to Earth in the 1990s. This powerful hero leads to a new phase for the Marvel universe, and promises to delivery even more in the final installment of the Avengers saga. Starting off a bit slow, Marvel's SHIELD series has grown to be a dependable corner of the MCU, one that tells consistently good, deep stories as it explores pockets of the universe the films simply don't touch. Released on the Freeform network, the thought of a superhero show on that backwater cable channel did not inspire confidence. But then Cloak and Dagger showed itself to be a nuanced take on the teen heroes genre and became a show well-worth checking out. Part of the Netflix corner of the MCU, Iron Fist debuted in 2017 and quickly became known as the worst series in the stable. What went wrong with the first season, and was that assessment really fair? Part of the Netflix corner of the MCU, Luke Cage has been working to clean up Harlem and fight thee threats, both homegrown and supernatural, that just keep coming to his part of NYC. Spun-off from the second season of Netflix's Daredevil, this series follows Frank Castle as he wages a one-man war against the criminal element in New York. Exclusive to Hulu, this series follows six teenagers on their adventures after they discover that their parents are supervillains. Can the kids take down their parents and save the world? Let's find out. DC TV vs. Marvel TV: A 2015 comparison of the state of Marvel's MCU shows and how they compare to where DC was at with the Arrowverse. Iron Spider: Homecoming: We look back at Infinity War and play a little thought experiment about the future of Peter Parker in the MCU. Thor Series Overview: We dive into the Thor series to see how the movies have evolved over time. Then we give a mini-review of the third film in the set. The James Gunn Firing: James Gunn, director of the Guardians of the Galaxy films was fired from the third film for tweets he made 6-plus years prior. We discuss the topic and see if this was a fair decision or not. Blade in the MCU: With Weslley Snipes once again talking about a return of the vampire hunter Blade, we discuss if Marvel should really bring the half-vampire into the MCU fold. Let's Do the Time Loop Again! : A look at the time loop sub-genre of sci-fi and fantasy, from Groundhog Day to the Cloak and Dagger and everything in between. Okay, Wait... What? : At one point DC was looking at putting out Batman v Superman up against Captain America: Civil War. We discuss why this was a stupid idea. Top 10 Movies (2014): A look at our favorite movies dating back to 2014. MCU films do make an appearance on the list. Top 10 Movies (2018): An updated look at our favorite films, this time from 2018. The MCU once gets high marks on the list. Red Sparrow: In 2018 Fox made a movie that seemed like a Black Widow film in all but name. We take a look at the movie to see how close the studio got to the mark. Winter 2019 Movie Preview: We take a look at upcoming movies for the first quarter of 2019, including 100% more Captain Marvel. Spring 2019 Movie Preview: A preview of upcoming movies for the second quarter of 2019, with more Avengers than you can shake a stick at.